Top shelf holds approximately 560 lb. Undershelf holds approximately 340 lb. 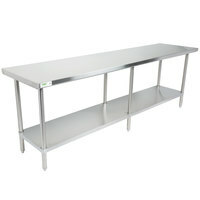 Increase your counter space with this Regency 24" x 48" commercial work table with undershelf! 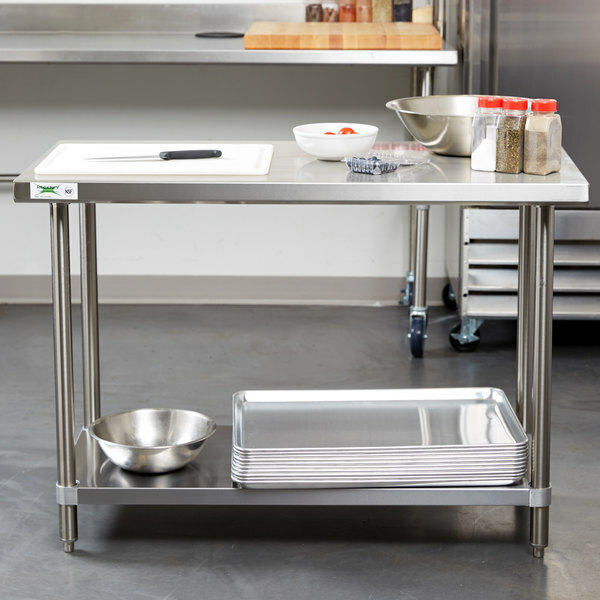 Utilize the space in your kitchen with this dependable 24" x 48" 16-gauge, 304-series stainless steel commercial work table from Regency Tables and Sinks. 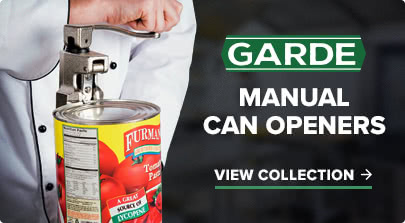 This unit not only provides plenty of room on its work surface, but also offers an 18-gauge, 430-series stainless steel undershelf to supply much needed space for food preparation, storing supplies, and other tasks within your business. 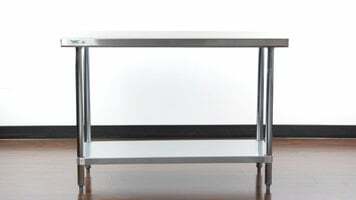 "This work table is great for restaurants. Its a great size and has a shelf underneath. 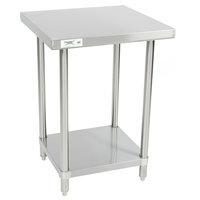 They make the perfect prep tables and shine beautifully." 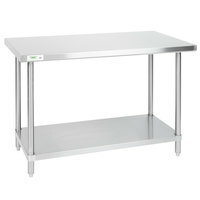 This work table's top shelf is made of 16-gauge type 304 stainless steel, while the undershelf is constructed from 18-gauge 430 stainless steel for a long-lasting, dependable service life. 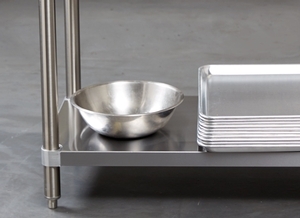 Plus, the top shelf boasts a weight capacity of approximately 560 lb., yet is lightweight enough to easily maneuver around your kitchen. 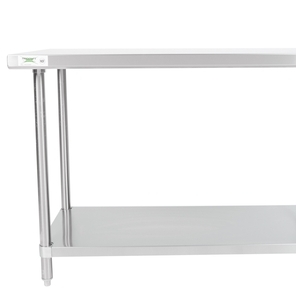 An accessible undershelf is provided below the main work table to add extra room for storing ingredients or small appliances as needed. 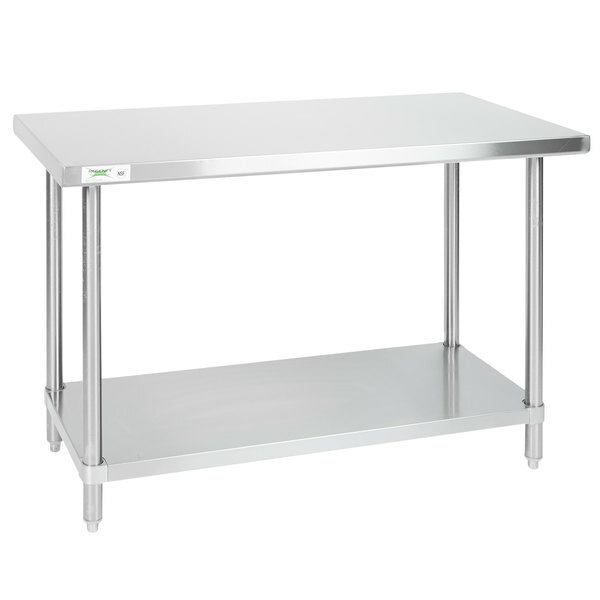 In addition, this stainless steel shelf is conveniently adjustable to better suit your needs and boasts a weight capacity of approximately 340 lb.! 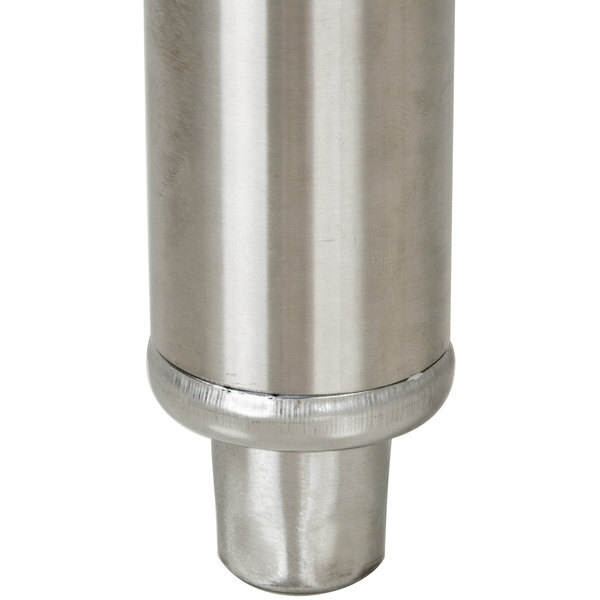 Mounted on 4 strong, 1 5/8" 16-gauge 304 stainless steel legs this unit will be sure to remain upright and secure. Order was shipped and received promptly. Problem was when I opened the box and pulled out the panels their was a medium size dent on the corner on the lower shelf. This dent was due to a round circle mark from the bottom side of the shelf in a three inch diameter circle. Protective tape on top side looked good. Pulled the top shelf out and immediately saw two dents about one third the way down the table. Both dents was about one and a half inches long and their was no visible dent marks in protective tape on top.. I know you get what you pay for but I would not complain if I put the dents in. Would not recommend this table unless you are going to cover the top. Thank you for the review, Dennis! We're sorry that the work table you received had a few dents. A Customer Solutions Representative will be in touch with you shortly about this. This table is a workhorse and its value is on the money. Mine came with a few dings and scratches but customer service compensated me. Thank you for your feedback, Patrick! 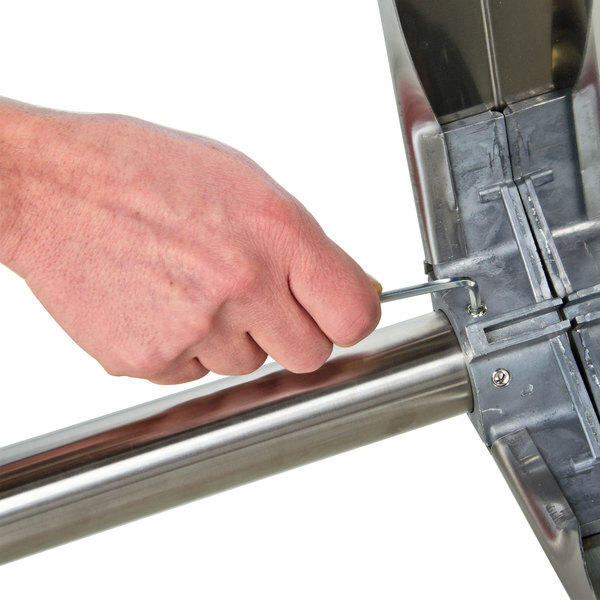 Our Customer Solutions team was happy to assist you with your scratched work table. If you have any concerns with your product in the future, feel free to reach out again! The price of these tables is a real bargain. Very sturdy top and undershelves. Assembly is extremely simple. The variety of lengths available is great. 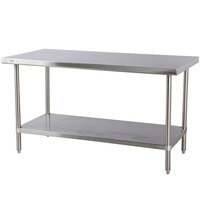 Great commercial work table from Regency. Very simple and fast to put together and it is fabricated nicely. The under shelf is sturdy and is super-useful. Beautiful and economical are two characteristics rarely used in the same sentence these Regency work tables somehow manage to fit the bill. I plan on keeping them clean and dry in hopes that they will provide a long rust free life! Just what I was looking for it has 2 storing shelves so it comes so hand to store your items and once you mount the casters it become handy I can move it to anywhere I needed it. Awesome table at a great price. 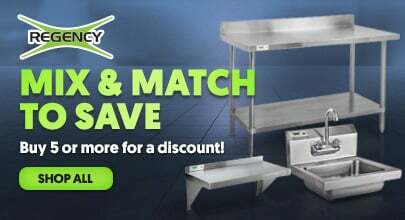 Even better price when you mix & match for quantity discounts. Assembly was simple. We would buy this table again. 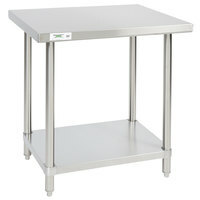 Great stainless steel work tables with undershelf! These come unassembled, but not difficult to put together. I would recommend having someone else there to assist in assembly, or at least help flip the table upright (they're pretty sturdy and hefty). 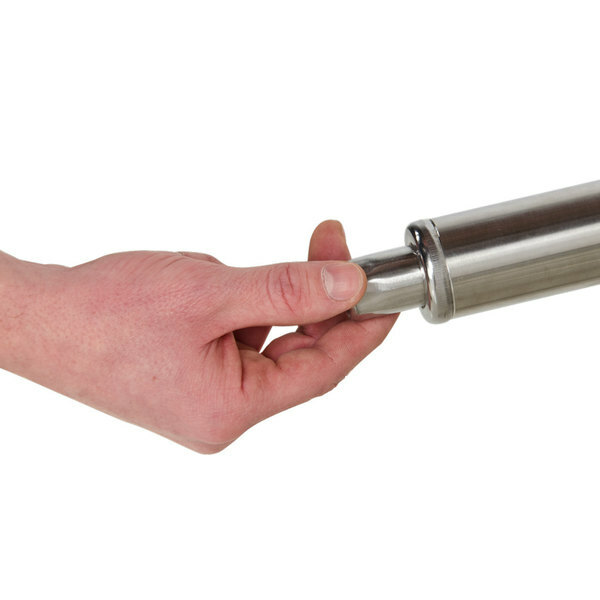 Easy to clean, and ideal for food service environments. The shelf below is really convenient for storage. I wanted something better than the standard 18 gauge table. This was it. 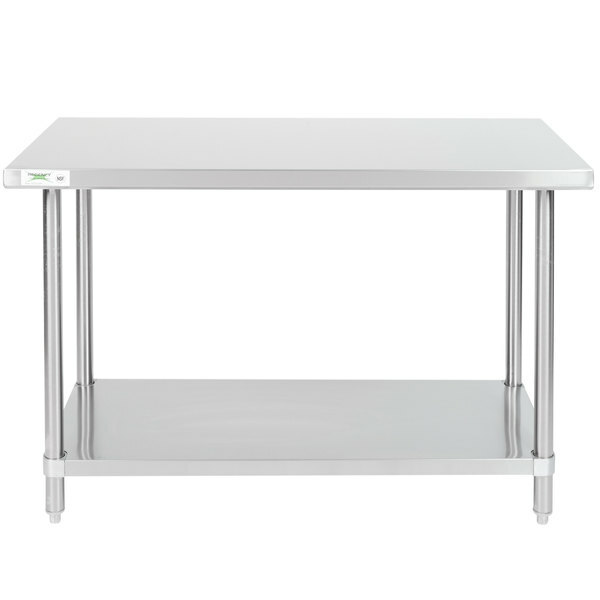 It also has stainless steel legs and undershelf compared to the other tables. 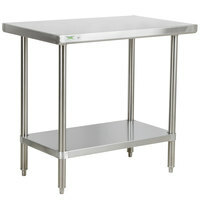 This work table is great for restaurants. Its a great size and has a shelf underneath. They make the perfect prep tables and shine beautifully. I purchased six of these 24x48 inch tables with straight sides and use them in groups rather than purchasing larger tables. The flexibility is exactly what I wanted. 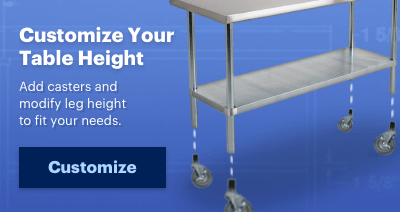 I'm short, so they are perfect, but I'm about to purchase casters for easy regrouping and to make them a better height for more users. Table is a handy size, this small work station suits many small spaces and helps fill up space you otherwise may not be able to use as efficiently. Undershelves are awesome for storage. I make a lot of sausage and i wanted a nice, sturdy, easy to clean stainless steel table for my meat grinder and other necessities. This table fit the bill perfectly! Solidly built! Excellent quality and an excellent value. 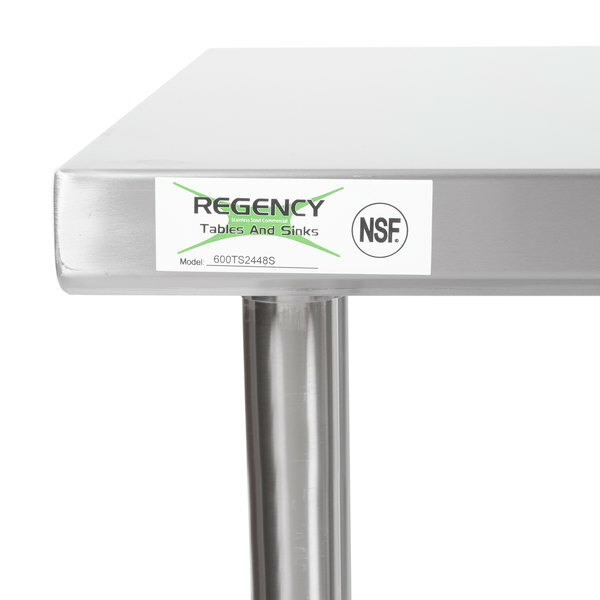 I love Regency 16 gauge stainless steel tables. I bought 3 of them! Would definitely buy again! Highly recommended! Fast delivery and sturdy! Holds both my commercial griddle and char griller. Came even a day early and we were able to open on time. 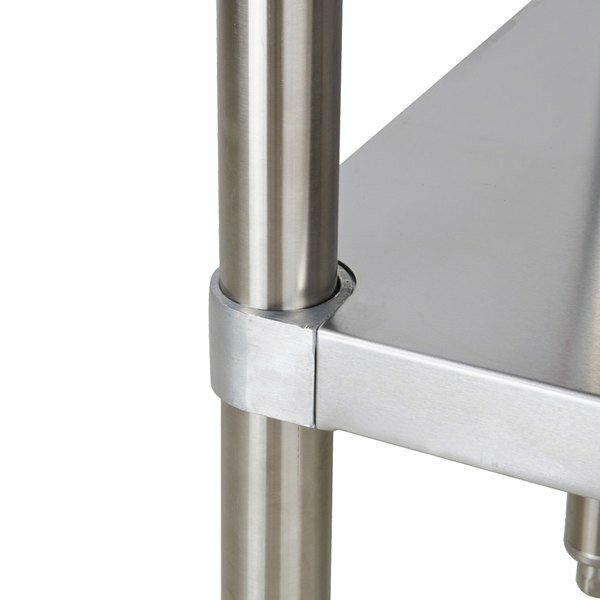 Really great, stainless table. Extremely sturdy and well built. Easy to set up and the bottom shelf is adjustable. Shelf can hold a lot of weight. I wish I had more space for more stainless steel tables. It cleans and disinfects well. Couldn't function with it. I will be ordering an addition to what I already purchased for functioning. I love this table. It fits a large cutting board, and a lot of other things, and I like to use the bottom shelf as a staging area for all the equipment I need soon or need to set out of the way. Big help in a kitchen in need of extra counterspace. The only warning is that you should be careful of sharp/hard things that you put on top to avoid scratching. Purchased this for use in my home and find it to be sturdy, functional and attractive. Has some minor cosmetic defects so if you are looking for perfection, better buy the expensive model but for the money this table is an excellent value. I am very happy with this purchase.